Ugly or pretty, unhealthy or healthy, cold or hot, we are a society that loves to label everything. We want everything to fall into a certain category, so we know exactly how to respond to it. However, when it comes to relationships, women are willing to settle for any label they can get their hands on! 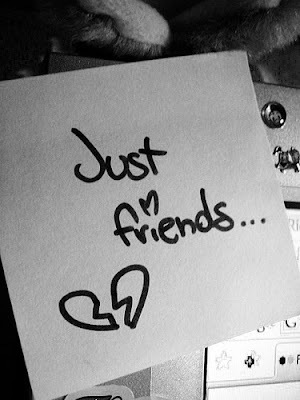 There is the infamous “friends with benefits” to “unofficial boyfriend and girlfriend” title. Everyone has a friend (or yourself) who has told a story about your new guy and included one of these faux labels. My favorite new label that I just heard about was “a non-relationship relationship.” I was on the phone with my good friend and this is what she is calling her situation with a guy. My friend seemed quite happy with how things were going but all I could think is she kidding? Oh, and that this guy was a genius to score such a sweet deal!The fact that there is a “non” in her relationship’s title means they aren’t together! So this got me thinking is the dating world extinct? I believe for right now it is. Guys are getting exactly what the want with out having to commit to anything. Unless something changes, the term boyfriend and girlfriend may disappear from our vernacular! What’s the craziest label you or your friends have accepted when dating someone? I read the other post on this topic, and the thing you're assuming is that ALL girls are desperate to "lock a guy down" with a label and ALL girls have to put a label on things or they have low self esteem if they don't? SO backwards. Confident girls don't need to "declare ownership". There are actually plenty of girls who are independent and don't need or want labels to feel validated.Putting a label on things is actually less secure. Love and trust happen through feelings, through behavior, through someone's action. If you need a public declaration - you're more concerned about how your relationship "looks to other people" than what's really happening between you and your partner. Saying "It's MY boyfriend!" doesn't mean anything. Guys who are labeled cheat and lie all the time - the label is irrelevant. Personally, I think this article feeds into some 1950's theory that all girls are running around desperately trying to "trap" guys, and all guys are running from relationships. Maybe guys are just running from the controlling label obsessed control freaks. Real soulmates and people who want to be faithful rather than feeling forced to be faithful - just are. They don't need to be scolded into doing so. I think you almost misunderstood the post, in my opinion. But with that said, I think the use of the term "label" is the post doesn't coincide with the traditional definition you're obviously giving it. I think her point is that women are doing exactly what you say they should be doing: they aren't trying to 'trap' men, and they're open to various types of non-traditional relationships, as evidenced by the example she gave with her friend being in a "non-relationship, relationship." The author also brings up a good point that's hard to deny; men are notorious for not wanting to settle, and women become naturally attached. It's normal for them to want relationships, but according to your view, they should adopt the "player" persona most men in college have, but instead, camouflage it as being "independent." Being a "confident" girl doesn't mean being clingy, but it also doesn't give you the right to be used. If you're seeing someone on a consistent basis, and even sleeping with them, women have the right to define the relationship. In my opinion, a weak woman is one that doesn't seek to have some understand of who or what she's involved with and in.